In these lessons, examples, and solutions we will learn the trigonometric functions (sine, cosine, tangent) and how to solve word problems using trigonometry. The following diagram shows how SOHCAHTOA can help you remember how to use sine, cosine, or tangent to find missing angles or missing sides in a trigonometry problem. Scroll down the page for examples and solutions. How to solve trigonometry problems or questions? Step 1: If no diagram is given, draw one yourself. Step 2: Mark the right angles in the diagram. 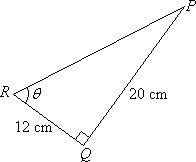 Step 3: Show the sizes of the other angles and the lengths of any lines that are known. Step 4: Mark the angles or sides you have to calculate. Step 5: Consider whether you need to create right triangles by drawing extra lines. For example, divide an isosceles triangle into two congruent right triangles. Step 6: Decide whether you will need the Pythagorean theorem, sine, cosine or tangent. Step 7: Check that your answer is reasonable. The hypotenuse is the longest side in a right triangle. How to use Cosine to calculate the side of a right triangle? Calculate the value of cos θ in the following triangle. Use the Pythagorean theorem to evaluate the length of PR. How to use Tangent to calculate the side of a triangle? How to use Sine to calculate the side of a triangle? How to solve Word Problems using Trigonometry? Example: The following video shows how to use the trigonometric ratio, tangent, to find the height of a balloon. How to solve Word Problems using Sine? This video shows how to use the trigonometric ratio, sine, to find the elevation gain of a hiker going up a slope. Example: A hiker is hiking up a 12 degrees slope. If he hikes at a constant rate of 3 mph, how much altitude does he gain in 5 hours of hiking? How to Use Cosine to Solve a Word Problem? Example: A ramp is pulled out of the back of truck. There is a 38 degrees angle between the ramp and the pavement. If the distance from the end of the ramp to to the back of the truck is 10 feet. How long is the ramp? Step 1: Find the values of the givens. Step 2: Substitute the values into the cosine ratio. Step 3: Solve for the missing side. How to solve Word Problems using Tangent? How to solve trigonometry word problems using tangent? Example: Neil sees a rocket at an angle of elevation of 11 degrees. If Neil is located at 5 miles from the rocket launch pad, how high is the rocket? How to determining the speed of a boat using trigonometry? Example: A balloon is hovering 800 ft above a lake. The balloon is observed by the crew of a boat as they look upwards at an angle of 0f 20 degrees. 25 seconds later, the crew had to look at an angle of 65 degrees to see the balloon. How fast was the boat traveling?